Enhance Your Skills, Boost Your Confidence and Get More Business! 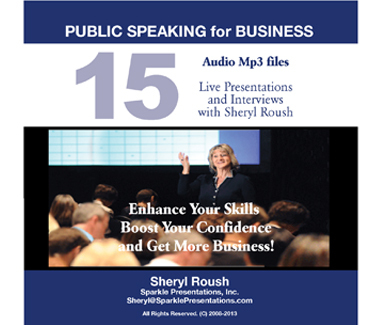 Sheryl Roush is a veteran of public speaking, a top-rated international communication skills presenter, an Accredited Speaker as honored for outstanding platform professionalism by Toastmasters International, and 20+ year Professional Member of the National Speakers Association. 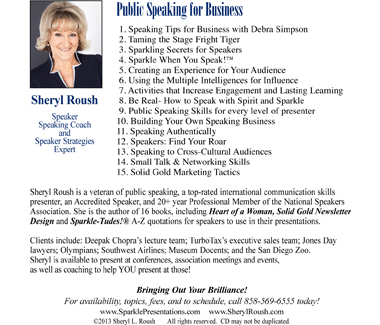 Clients include: Deepak Chopra's lecture team; TurboTax's executive sales team; Jones Day lawyers; Olympians; Southwest Airlines; Museum Docents; and the San Diego Zoo.